Chattanoogan.com - one of the most read online newspapers in Tennessee - is the top venue for Internet advertising in Chattanooga. With over 1.2 million visits a month, we can get customers to your website. Otherwise, they may never find you in the maze of Internet choices. One law firm got over 1,000 click thrus per month via their Chattanoogan.com skyscraper banner. Some of our advertisers with the small Premiere banners get as many as 5.6 million impressions (when your ad is showing and a reader is on that page) in a month. Your ad stays on the screen seven days a week, 24 hours a day. And we can tell you exactly how many of our readers are clicking onto your website from Chattanoogan.com as well as the number of impressions (when it is on a screen that a reader is on). Chattanoogan.com is free to all readers. There is no "paywall" that greatly limits the number of Chattanooga-area potential readers seeing your advertisement. There are no annoying pop up ads. Some advertisers provide their own banner ads, or we can provide a colorful design for your ad at no extra charge. We'll email you the design and let you approve it before it is posted. Click here and here to see where ads are placed on our pages. Get huge visibility with our 160x600 pixel skyscraper banner ads which run down the right side of all our screens. The maximum file size for a Skyscraper banner is 150 kb. You will gain maximum exposure with a Prime Sponsorship. You will be in the rotation for a wide 728x90 at the top of each page and a 468x60-pixel spot at the center of our pages and articles. 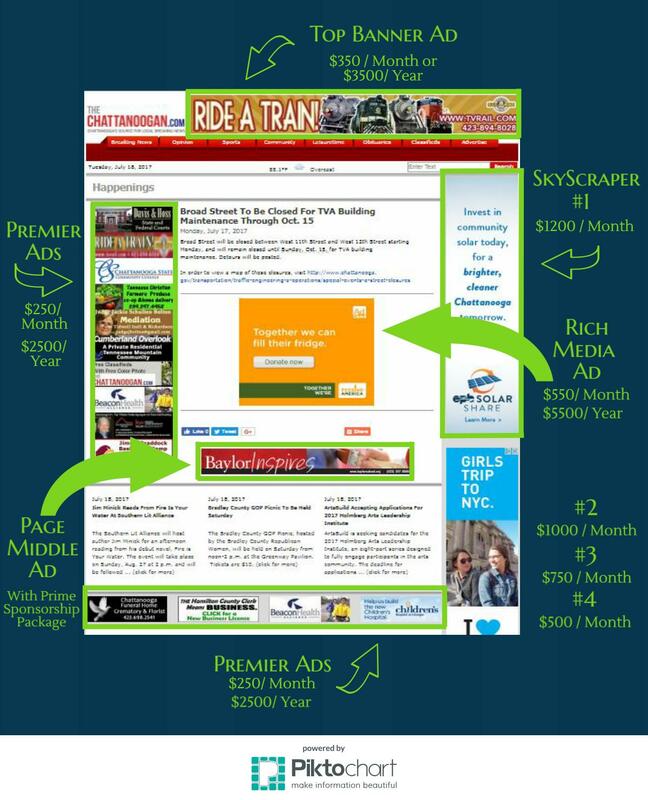 Your ad will also be placed in the Premier rotation of 180x60 pixel ads. Maximum file size for the 728x90 is 55kb. Maximum file size for the 468x60 is 45kb. Maximum file size for the 180x60 is 30kb. These are large banner ads that are included in the middle of all our articles except the obituaries. They are also in a prominent spot on all our section pages, meaning they are on every Chattanoogan.com screen except obituaries. These are 300x250 pixel ads. Maximum file size is 75kb. These allow your business to be featured with a 180x60 pixel ad. Maximum file size is 40kb. These ads come up very frequently on both the section pages and the article pages and get millions of impressions each month. For realtor ads and help wanted classified ads, there is a charge of $30 for 30 days. Realtors who have a banner ad with us are able to run unlimited classifieds at no additional charge. There is no word line limit, though it is more effective if they are not overly long. Our classified ads are free and include a free color picture - except there is a $30 charge per month for Help Wanted and for Realtor ads. Advertising for a camp or clinic is available. This comes with an article on our site telling about the camp. The Premiere banner ad will click to the article unless you have a web page for the camp. If you are interested in advertising in Chattanoogan.com, email news@chattanoogan.com or call 266-2325 for more information.